It is a commonly held belief that the Obama administration has been spending money all over the place, increasing the size of the government and the number of people it employs. There is a bit of a problem with this, though–it is factually inaccurate. Today I intend to illustrate and prove that this belief is not in line with reality. The first thing we have to remember when we talk about government spending is the amount is has to increase purely to keep up with inflation. Average inflation under the Obama administration has run at just over 2%, and consequently state spending can rise by around 2% without the size of the government increasing. The second thing we have to remember is that the US population has increased during Obama’s term, and so the amount spent can rise to reflect population growth. To adjust for population growth, instead of looking at total spending, we look at per capita spending, or the amount spent by the government per person. Any measurement that does not both take into account inflation (uses the word “real” or the phrase “inflation-adjusted”) and take into account population increases (“per capita” or “per person”) is either accidentally or deliberately misleading. This data gives us the change in total government spending at all levels adjusted for inflation per capita. We can see a spike in spending in 2009–that’s the stimulus package (and we can also notice that Bush’s toxic asset relief programme (TARP) provided a very similar spike in 2008). 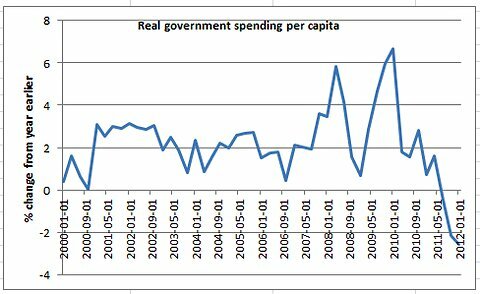 After that, however, the increases drop back down to pre-recession levels and then fall further, into actual spending cuts. Recall that spending increased considerably from 2009-2010 via the stimulus, then spending growth fell off and eventually began reversing direction. 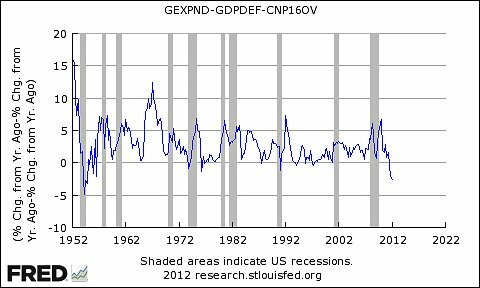 What we can see is that during the period in which the government increased spending the most and immediately after that period (it does take some time for stimulus to work its way through the economy), the recession ended and three quarters of near-4% growth were put together consecutively. As the spending tap was shut off, growth became much more plodding and slow paced. The current malaise, accredited to Obama’s big government stimulus policies from the first two years of his presidency, really appears to have been caused by the austerity policies pursued across all levels of government in the latter half of Obama’s first term. Coincidentally, this is when the republicans seized control of the house of representatives and, among other things, prevented stimulus round two, more formally known as the American Jobs Act, from becoming law. What’s all of this data shows is that there has been no giant expansion of government, no clear demonstration of socialist tendencies, nothing at all to indicate that the version of reality the right purports to have happened over the last four years actually took place. In the last two years, the government (as a whole–federal, state, and local) has pursued draconian spending cuts and seen reductions in rates of economic growth. The answer from Mitt Romney and company is more of the very policies that have created the situation that they themselves consider to be a failure on the part of the Obama administration. The logic of the right, when corrected for factual error, is not logic at all. They are calling deep cuts in government spending unprecedented increases in government spending and asserting that the situation that results has come about due to the spending they imagine rather than the austerity that exists. It is an abject fantasy, and yet millions of people continue to believe it because seemingly serious pundits and candidates are telling them it’s true. With that level of misinformation, it’s no wonder that somehow Mitt Romney is managing to look like a credible alternative to Obama despite advocating policies that amount to more of what we have already been doing the last two years–disastrous spending cuts in the face of a weak economy. So based on your numbers, why are we calling Obama and Clinton “liberal” and the Bushes and Reagan “conservative”? Anyone who supports Obama is a conservative fiscally, supporting smaller government. I always felt smaller central government was the way to go. It doesn’t make much sense, does it? American political terminology has more relation to political rhetoric than it does political reality. Dear Benjamin S. I wonder if you could do a post that explains how cutting 10s of thousands of federal employees will actually impair the economy in the US….